U.S. Sen. Rand Paul was recovering Sunday from five broken ribs after he was assaulted by a neighbor who tackled him from behind at the senator's Kentucky home, officials said. 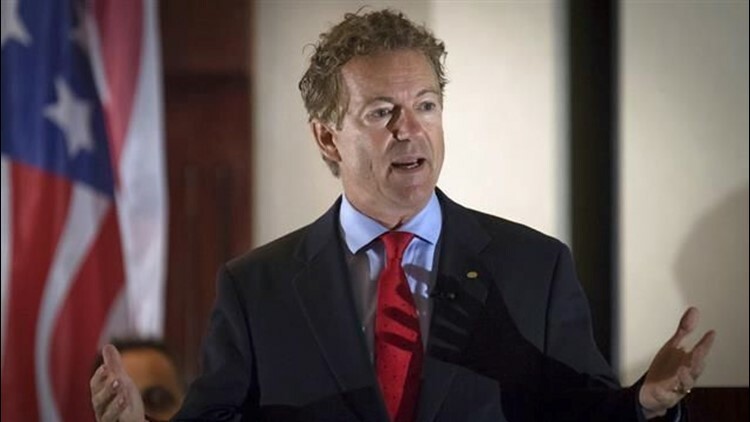 FRANKFORT, Ky. (AP) — U.S. Sen. Rand Paul was recovering Sunday from five broken ribs after he was assaulted by a neighbor who tackled him from behind at the senator's Kentucky home, officials said. Senior Adviser Doug Stafford said it is unclear when the Republican will return to work since he is in considerable pain and has difficulty getting around, including flying. Stafford said this type of injury is marked by severe pain that can last for weeks to months. "This type of injury is caused by high velocity severe force," Stafford said in an email to The Associated Press. The Bowling Green Daily News reported that an arrest warrant said Paul told police his neighbor came on his property and tackled him from behind Friday, forcing him to the ground. He had trouble breathing because of a rib injury, the warrant said. A Warren County official did not immediately respond to an AP request for a copy of the arrest warrant. Police arrested 59-year-old Rene Boucher on Saturday and charged him with misdemeanor fourth-degree assault with a minor injury. Boucher lives next door to Paul and his wife, according to Warren County property records. Boucher was released from jail Saturday on a $7,500 bond. He has a court date scheduled for Thursday. Boucher did not return a phone call from The Associated Press seeking comment. It is unclear if he has an attorney. A spokeswoman for Paul said he was "blindsided" by the attack, but did not provide more details. Police have not said what motivated the attack. Kentucky State Police Master Trooper Jeremy Hodges said the FBI checking to see if the attack was politically motivated. FBI spokesman David Habich said the agency is aware of the incident and is "working with our state and local partners to determine if there was a violation of federal law." Stafford said Paul had three displaced fractures, which can lead to life-threatening injuries, as well as lung contusions. Paul and his wife, Kelley, "appreciate everyone's thoughts and well wishes and he will be back fighting for liberty in the Senate soon," Stafford said. The attack was a shock for the community in Bowling Green, where a neighbor says he would often see Paul and Boucher out walking their dogs on the normally quiet streets. Jim Skaggs, a member of the state Republican Party executive committee, lives in the neighborhood and has known both men for years. He said they disagreed politically, but was shocked to hear of the incident. "They were as far left and right as you can be," Skaggs said. "We had heard of no friction whatsoever other than they just were difference of political opinion. Both of them walked their little dogs at about a mile and a half circle, a nice little dog trot. I'd see them out walking, maybe they might stop and speak with each other." Boucher is an anesthesiologist and a pain specialist. He invented the "Therm-A-Vest," a cloth vest partially filled with rice that when heated can be worn to relieve back pain, according to a 2005 article from the Bowling Green Daily News .